Date: 6 February 2014. Time Stopped. Bob Winter is the sort of person who personifies a man determined to prepare his boat for the very worst that could happen at sea. When younger he owned an eTap day-sailer and spent 19 years in New York waters gaining experience sailing and enjoying boating on a recreational level. But eventually there grew in the back of his mind the realization that the time on his eTap was in preparation for real cruising. Cruising is what Bob said he wanted to do. Initially his goal was to cross the Atlantic but he later revised that for simple island hopping. Bob talked about going to the Bahamas. That's less than 50 miles from the coast of Florida. 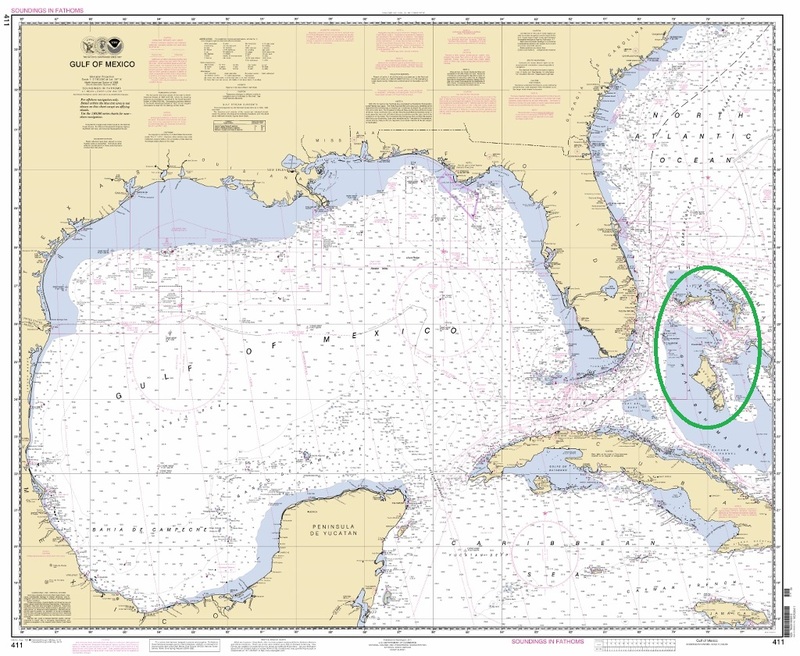 The Bahamas are right off the southeast coast of Florida. Bob was a member for numerous years of the Cornwall Yacht Club in New York before heading south. He spoke often of old friends there and admired the men and women who actively sailed. I remember he even had a burgee from the club. 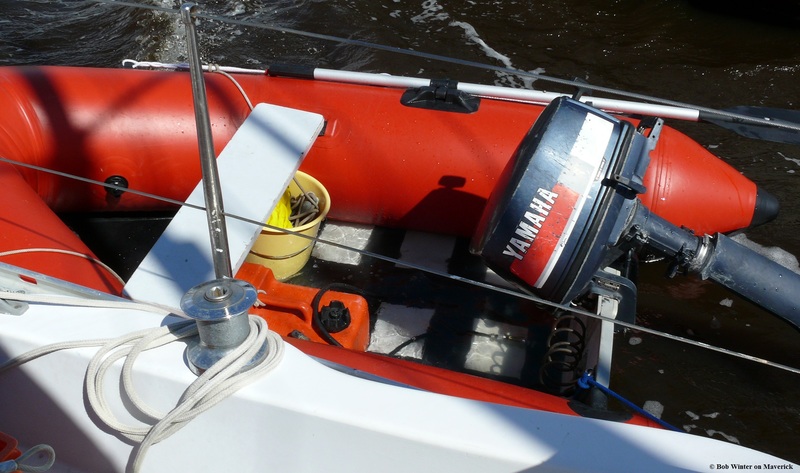 Like other associations, boaters tend to have long term relationships. We might not see you for a half dozen years or more but when together will catch up. I met a transvesselite* named Bill and was able to share the location of mutual friends Tina and Dave. And I'll expect him to catch me up on the Schucker and Grand Banks owners I met aboard his power-cat. *Transvessselite - a boater that starts out on a sailboat but gradually realizes that power boats are better and switches sides. Pronounced: Trans-vessel-ite. Bob, bless-his-heart, is quite a character. He always gives me heck for calling the sole of my boat a deck. Inside, it's a sole. Bob knows his Chapman's inside and out and is a great resource for terminology. 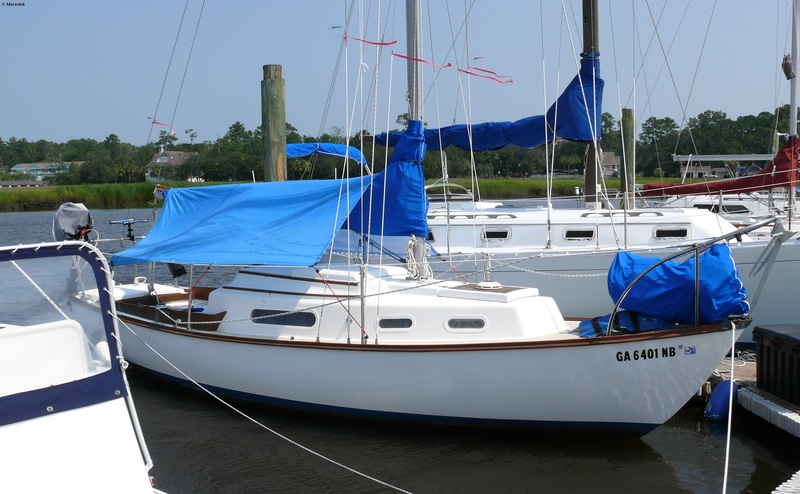 This is Bob's boat Maverick, a 27' sloop. He also loves photography, a passion that began when he was serving in the United States Navy. Often Bob has his Nikon camera around his neck and he is the guy taking pictures at get-togethers and such. At ThinkGeek I found a coffee mug that is shaped like a camera lens. It was a great gift as the one thing Bob likes better than cameras is coffee, black, with lots of sugar. 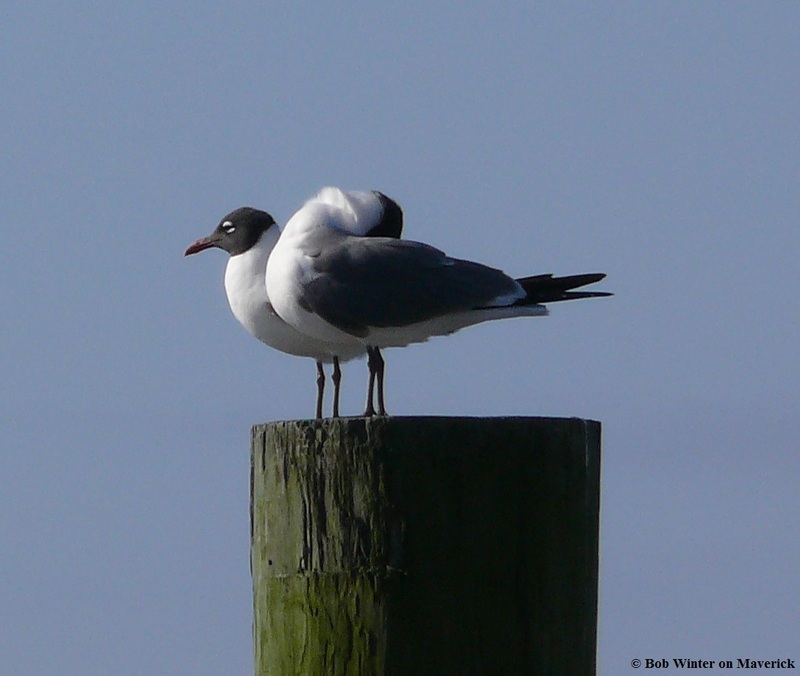 Bob enjoyed learning about and photographing birds of all sorts. I gave him a copy of my favorite bird book, Birds of North America. 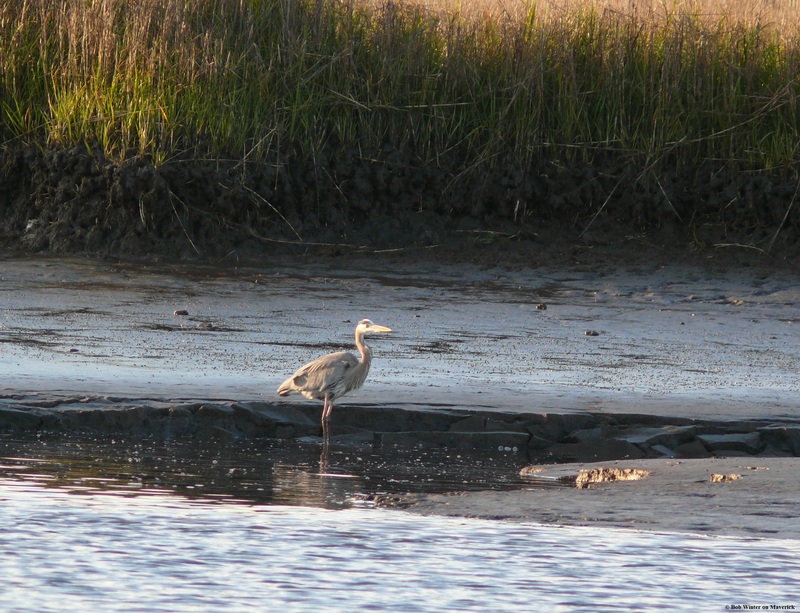 Blue Heron on mud bank. Of course you don't pass the half century mark without learning a few things. Bob chose a marshmallow (AKA inflatable dinghy) that is red. One of the problems with the usual grey ones is they are less visible on the water. His stands out very well. Because it is so distinctive it's less likely to disappear -- another benefit. Well, it's not my fault. I am totally innocent except for the guilty part and really, that wasn't me initially. I was only taking advantage of too good an opportunity to let pass. And you'd have done the same thing too! Maybe. It all started after we'd received our orders. Bob had selected shrimp fajitas (pronounced: fa-heat-ahs) and the shrimp were large and numerous. It looked delicious. I was having tacos -- not bad, but certainly not the quantity of food that Maverick received. Ken on Sparrow was sitting within reach of Bob's plate and took his fork and speared a shrimp from Bob's plate. I did not see this occur. What I did see was Ken looking up and around -- the picture of innocence. But I knew better. Scanning the table to see what was up, I spotted the big shrimp on Sparrow's plate. Quickly I retrieved my fork, stabbed the shrimp and popped it in my mouth. It was delicious. About this time Bob realized what had happened and suspected that I had put Ken up to it. I do have an affinity for shrimp which is known, but this time I was totally innocent. Ken, sitting within reach had taken what didn't belong to him. That's an extremely bad thing. A little tiny bit of justice was served when I kept Ken from profiting from the theft. No need to thank me. But apparently my reputation as a shrimp thief was born that day. Bob did eventually realize who the real culprit was, though I suppose I'll always take some ribbing for the acquisition of that particularly scrumptious shrimp. And Bob is a good sport: he took me back to El Potro so we could each order the shrimp fajitas. His treat. Still, what I like best about Bob is that even after I left the area, he called almost every day. And each time I hauled in the anchor while underway I gave him a call. He became my cruising partner, albeit via the telephone. Almost every evening I could count on a phone call from Bob. We'd discuss the weather, my engine swap, upgrades done and yet to do. It was such a nice treat for me to have a sounding board though he didn't always agree with me. I want a watermaker. Hauling water to Seaweed is probably the most physically difficult task there is, and Bob regularly shot down the idea. He suggests and rightly so, that taking the money not spent on a watermaker and going into a marina would solve the water issue. Of course this presumes there is a marina nearby. I tend to prefer the more remote locations. And I still want a watermaker. But what Bob said he most wanted to do was cruise. 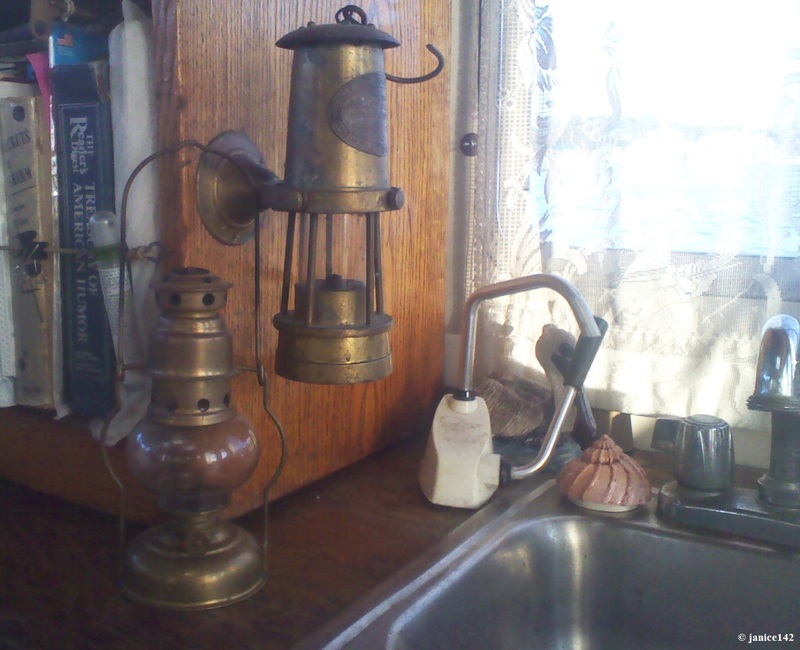 He has a pair of oil lanterns I got for him in case he didn't want to use his batteries for the regular lights inside his cabin. I have a matching set. His boat has an Air-Breeze wind generator. It has two new batteries, a well-maintained engine, and more. He just upgraded to pressure water aboard, after getting tired of the hand pumps. Maverick is "almost" ready to cruise. Alas, last week Bob got very sick and ended up in intensive care at a local hospital. Once stabilized he was transferred to a second hospital. It was pneumonia. At his age, 72, physically there are serious complications and the prognosis is not stellar. The likelihood of Bob cruising on Maverick has decreased dramatically. But his boat is ready to go, almost. And I am beyond sad. I miss my phone buddy, and my real life friend who probably won't get to meet me in the Bahamas. R.I.P. Robert Winter. 20 December 1941 - 6 February 2014. I'd love to read your remembrances of our Bob. Bless his heart. And, have you met someone like Bob who was almost ready to go, but didn't get to? Republished on http://americanathebeautiful.com/ ~ 14 February 2014. A favorite aphorism: The world is moving so fast these days that the man who says it can't be done is generally interrupted by someone doing it. Elbert Hubbard, philosopher, author, publisher. 1856-1915.